1. If it rains for an extended period of time when cherries are ripe, they get so full and fat on water that they can burst, causing "splits." Split fruit rots quickly and is, therefore, unmarketable. In order to dry off their fruit, many cherry farmers hire helicopters. The helicopters fly very low over each and every row of the orchard, and the wind (purportedly) blows the water off the cherries. It's outrageously expensive (hiring a private helicopter, and all), but the alternative is to lose your entire crop. 2. To be able to export cherries to other countries (including Canada), a pesticide residue test must be performed. So about a week before harvest, we collect five pounds or so of cherries and take them to the lab. They mush all of the fruit up and test for residual pesticides before we can get the go-ahead to sell. 3. The best tasting fruit is slightly over-ripe, but you'll never get it in the grocery store because it doesn't transport well. We eat the best and sell the rest. Cherry harvest is coming up soon. Keep us in your prayers! Let the cherry harvest novenas begin. Hey, St. Isadore, the cherry and hay farmers could use some help. Mmmm, I just bought two bags of cherries at the store yesterday. Good luck on your crop. Interesting. 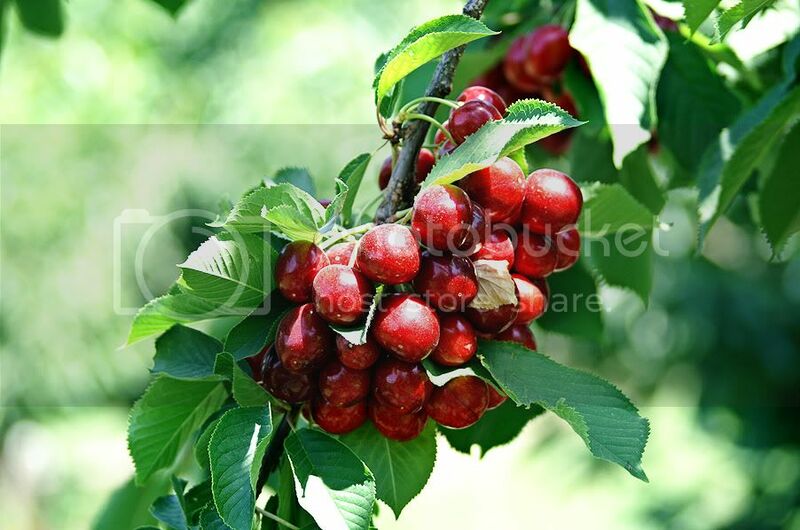 Question: If the cherries are ripe and it is going to rain, why don't you just harvest them? I'm no farmer, so I've no idea, but it seems it would be cheaper to just harvest ripe cherries than pay a helicopter, especially if you can't sell the over-ripe ones anyway?